The USD/JPY was pressured by mounting fears on trade. Powell's testimony stands out in a busy week. The technical picture is bearish for the pair. The FX poll shows a bearish bias on all timeframes. US President Donald Trump and his Chinese counterpart Xi Jinping agreed on a 90-day trade truce in their meeting in Buenos Aires. However, the statements from Washington and Beijing differed. It took the Chinese authorities quite some time to acknowledge some of the American comments on pledges to buy agricultural goods, and they did not echo Trump's tweet about dropping car tariffs. The most significant blow to the hopes for a trade truce came after Canadian authorities arrested Meng Wanzhou, CFO of Huawei and the founder's only child. She was detained in Vancouver upon a request of a US court. 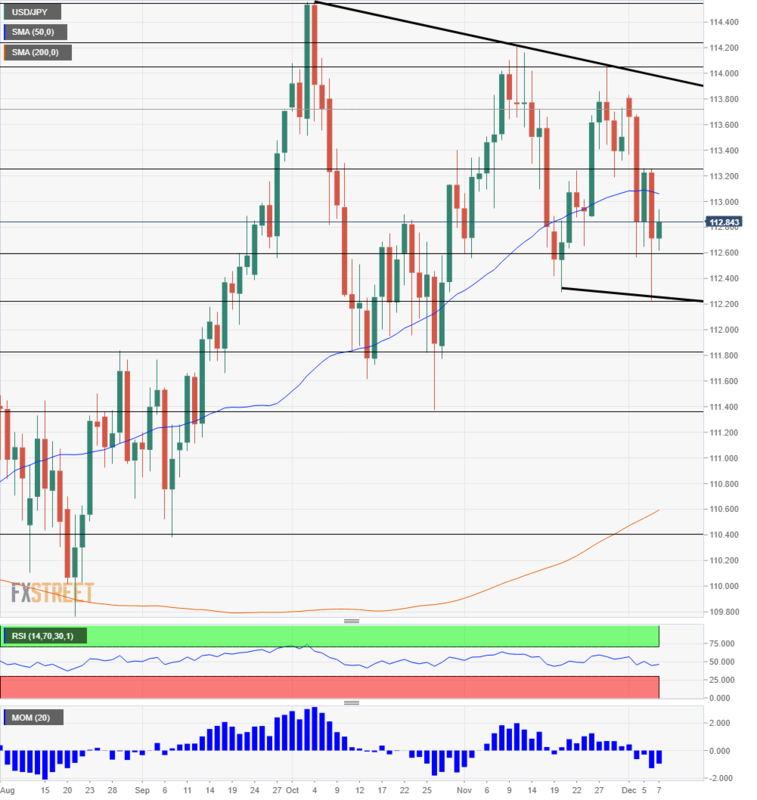 The move dampened the atmosphere and weighed on USD/JPY. US data was mixed with the ISM Manufacturing PMI's beating expectations. However, the ADP NFP slightly missed expectations. The all-important jobs report slightly missed expectations. The US gained 155K positions against 200K expected and Average Hourly Earnings rose by 0.2% MoM against 0.3% projected. However, salaries increased by 3.1% YoY, a robust rate. Fed Chair Jerome Powell offered a more upbeat tone in a public appearance, praising the strength of the US economy and sounding bullish on the labor market in particular. His words in the previous week were perceived as dovish, albeit for no good reason. Other Fed officials provided a broader array of opinions, with some wanting to adopt a "wait and see" approach soon. Bank of Japan officials continued stressing that they will continue with their ultra-loose monetary policy, unsurprising given the low levels of inflation. After a calm start to the week regarding economic indicators, the US releases the Consumer Price Index (CPI) report for November on Wednesday. Monthly rises in prices were OK in October, but the year over year Core CPI disappointed by decelerating to 2.1%. The slide in prices was later reflected in the Fed's preferred measure of inflation, the Core PCE, which slid to 1.8% YoY. The inflation data will likely be overshadowed by the testimony by Fed Chair Jerome Powell's testimony. The world's most powerful central banker made several public appearances in recent weeks — his comment about interest rates being "just below" the range considered as neutral sparked a market rally on hopes that the Fed is nearing the end of its tightening cycle. However, a more in-depth look at the same speech and his more recent speech changed the picture. The prepared remarks are published before the event and will help clarify the intentions of the Fed. He will then face lawmakers for a lengthy Q&A session in which he could provide further insights, one week before the Washington-based institution is set to raise rates and publish a fresh forecast for the path of interest rates in 2019. Thursday sees the weekly jobless claims which dropped after gaining beforehand, yet a more substantial event awaits on Friday: Retail Sales. The US economy is centered on consumption and consumers were out and about in October: the volume of sales rose by 0.8%, core sales by 0.7%, and the control group by 0.3%. We will now receive figures for November, the month including Black Friday. While the greenback attracts some safe-haven flows, the Japanese yen is the No. 1 safe-haven currency. The currency of the Land of the Rising Sun rises when stocks fall. The primary downside driver for shares has been trade or lack of progress on trade talks. The pair will likely continue following comments from both China and the US, with a special focus on Trump's tweets. Progress on talks or gestures such as the release of Meng or China buying US goods could alleviate tensions and push the yen lower. In Japan, the Tankan survey data will be of interest and the numbers may drop from the highs. The Bank of Japan uses the data in its calculations. Dollar/yen slipped below the 50-day Simple Moving Average, and this is a bearish sign. Moreover, it is posting lower highs and lower lows as shown by the thick black lines on the chart. 112.60 which supported the pair several times in early December and also back in early October. 112.20 was a trough early in the week. Further down, 111.80 provided support in October and worked as resistance in late August. Lower, 111.40 was a swing low in late October. The next line is much lower: 110.40 which was a swing low in October. 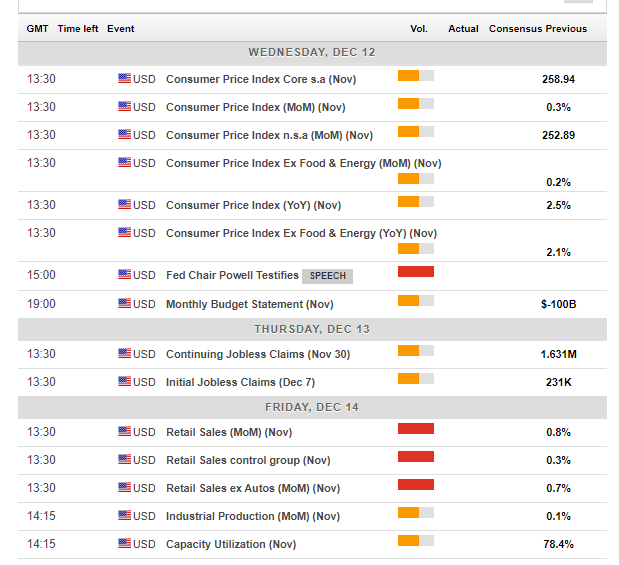 113.25 capped USD/JPY in early December. 113.80 was a peak around the same time. Further up, 114.05 was a peak in later November and is followed by 114.25 seen earlier last month. The 2018 maximum of 114.55 is next up. Concerns about the global economy are not going, especially with the hawkish Fed. Another slump in stocks cannot be ruled out and USD/JPY is likely to follow. 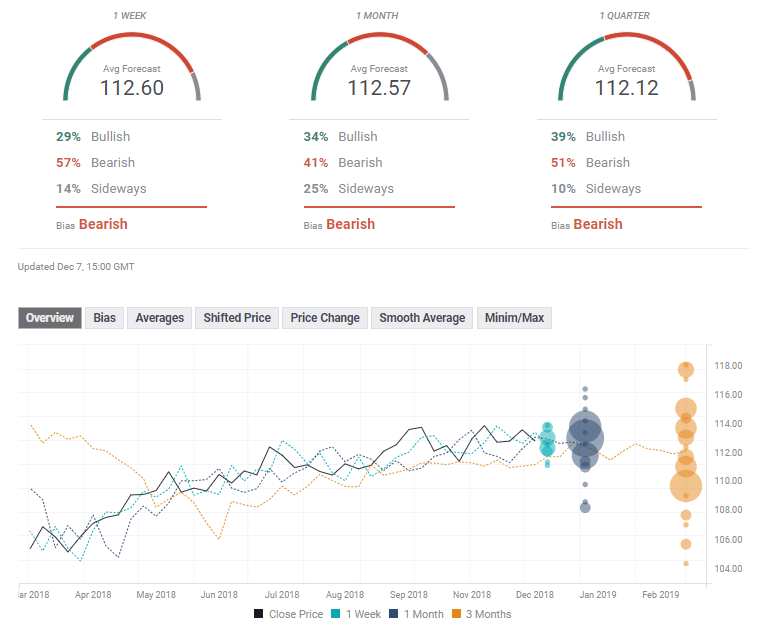 The FXStreet forex poll of experts shows a bearish bias on all timeframes but targets have not shifted that much from the previous week.